Geo Targeting for DR Goals: Is it Right for You? Background: This brand’s products were only available in half of the US states, and only regionally within those states. We were capping out on a regular basis with our national campaign. Strategy: We decided to test geo-targeting generic terms (anything that wasn’t associated with their brand terms). Our reasoning for keeping brand terms national was that if people were searching for the brand, they already had the brand awareness and maybe they were looking for service with this particular provider, for example, if they were moving. Results: We saw a huge spike in efficiency (CTR). 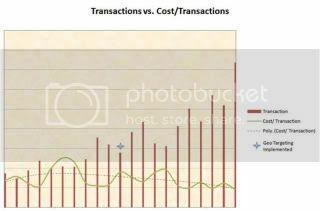 Our clicks did not drop, nor did spend (though CPCs dropped as we were more efficient and quality score strengthened). We were held to a Cost/Registration goal, and because we were now reaching only people who could sign up, our cost-per metrics improved significantly. Previously, we were getting people clicking on “cell phone provider” who were outside of our coverage area. They would explore the site, like what they saw, and try to sign up….but could not. 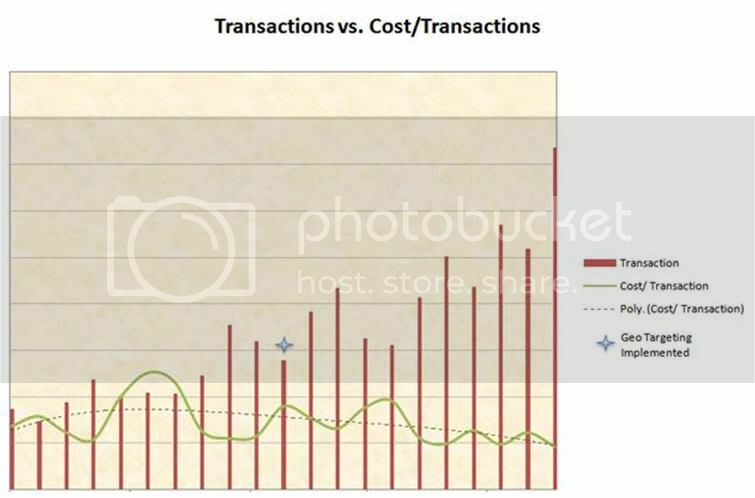 These were wasted clicks, driving up cost when service was not available to these particular users. Take Away: Essentially, we were able to utilize Geo-Targeting at the state level to eliminate & cut out people outside of our service area, versus utilizing Geo-Targeting to serve specific messaging to gain incremental users. If you have concerns about missing out on folks traveling and/or brand awareness, test keeping branded terms on a national target. Or build out national targeted geo-mod terms. For example, if I was traveling to D.C., I might search for “restaurant in D.C.” and if this is nationally targeted, I will still get a relevant ad. I like food, so certainly I would click. Maybe I would get a coupon, use a store locator, and go dine in high fashion in D.C.
Background: This brand offered trips to approximately 10 end-destinations, with 8 methods of travel to get there. Each had a launch/destination/method of travel combo (i.e. Air Force One going to Camp David, leaves from the East Lawn Airport….got that? So within that trip there is a method of travel, destination, launch venue…) For this account, we were capping out on a daily basis for one of our national destination campaigns, even though we had already implemented some day-parting, negatives, etc. On top of capping out, we were having trouble filling a certain method of travel (obviously it is not profitable to burn fuel a only half full ship/boat/train/etc…). Strategy: In order to capture additional traffic and leads with a limited budget, we implemented a geo-targeted campaign to target folks within a 3 hour driving radius of our launch venue, East Lawn Airport in the previous example. With the economy being as it is, less people are likely to be able to afford flying across the U.S. to take a trip, so we are targeting the “staycationer” here. Since we were capping out in our national campaign, we were losing impressions (and thus clicks) to these people who had a higher propensity to book, as they don’t have to buy extra plane tickets to get to the East Lawn Airport. 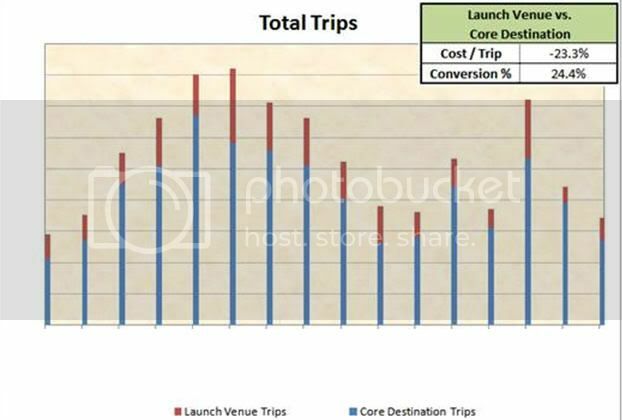 Results: We were able to drive incremental trip reservations through our geo-targeted campaigns targeting launch venue areas. 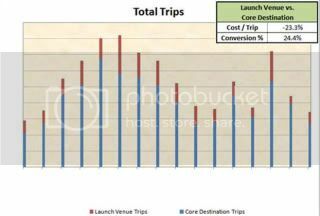 Our main goal was to drive additional trips to our under-performing campaign specifically, leaving from a few specific launch venues. However, we had some launch venue ports that didn’t drive any incremental trips; definitely a test-and-learn scenario for each destination/method of travel/launch venue combo. There were many factors to consider when setting up the tests—For example, the launch venue East Lawn Airport may have had 4 trips leaving a month, whereas West Lawn Airport may have only had 1 trip every other month—so it was important to weigh all factors. However, we found some great results after testing. Take Away: Whether you are looking to drive incremental people to your site, or cut out people who may not be the most relevant target, I’ve found geo-targeting can have positive results for DR clients. Test, learn, implement, test….Good Luck!